This letter is to recommend Blue Haven Pools for your pool design and construction. As a customer, they continue to exceed my expectations…While I appreciate the wonderful customer service from the staff. I am exceedingly pleased with the pool itself. It is basically maintenance free. Everything today looks as beautiful as the day it was finished. Blue Haven Pools & Spas in Indianapolis creates designs for backyard resorts with close attention to the needs of our local customers. Our A+ Better Business Bureau rating was earned by listening to our clients, identifying the best options for them, and building high-quality inground pools. Indianapolis inground swimming pools are in demand for a reason: Homeowners want to enjoy their backyards with an attractive outdoor space they can use for healthy family fun. We want to make that happen. 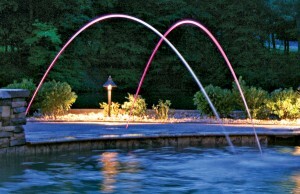 Toward that goal, we choose materials to use for building pools that will provide years of beauty and durability. To create the pool shell, we use gunite, a form of concrete which is applied over a tough, reinforcing frame of steel rebar. The result is a custom design that will last for years to come. Additionally, our operation has won an Aqua Design award, and we have continuously participated in both the Indianapolis Home & Patio Show and the Indianapolis Flower Show since 1999. For several of the events, our team even built the official show swimming pool for attendees to see. Another reason to choose Blue Haven to install your backyard dream is the ease and comfort you can experience from our latest technology. 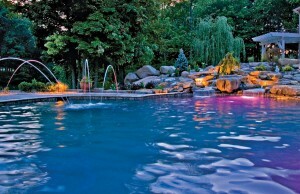 Our SmartFeatures™ help enhance your family’s swimming enjoyment, as well as your efforts to conserve water and energy. While protecting the Earth´s precious natural resources, this technology helps generate savings in money and time for you as well. Your inground swimming pool can have a variety of surrounding features and accessories. From adding a convenient automatic pool cover for enhancing safety to including an entire pool house, our team will plan and build your perfect outdoor haven. Our Indianapolis team has earned a reputation for high service standards. Our owner regularly visits each inground pool installation at the job site to ensure that quality control is at its highest level. Our team members specialize in inground swimming pools, and they work within each client’s budget during the comprehensive planning stage. After a thorough on-sight assessment is performed and your needs are considered, a Blue Haven designer will provide a comprehensive estimate associated with your inground pool. You will receive a written proposal, and your contract will contain detailed pricing. We can help arrange pool financing (oac) as well. Our company’s work is backed by with a limited lifetime structural warranty. We value the relationships with our clients, and we strive to provide them with a product that delivers lasting quality and enjoyment.